Hi-Lo card counting system is considered to be one of the easiest blackjack systems which was created specially for new comers and intermediate players of blackjack card game. This counting system is usually used by all blackjack teams, and it is based on the main principle of card counting: start counting from 0 and add/subtract 1 point each time when a card is dealt from a shoe; so, it reminds The KO Count somehow. Hi-Lo card counting was developed by Harvey Dubner: he took the counting system of Edward Thorp and explained it in more understandable way for average players. This system is perfectly described in the bestselling blackjack book of Stanford Wong - Professional Blackjack. 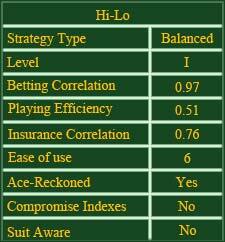 Hi-Lo count is also known as Plus-Minus System or High-Low Counting; it is considered to be perfect for multi-deck blackjack game. The main thing to know about this counting system is the value of every card from a deck. Hi-Lo count is called to be a balanced system because after you finish counting a shoe with the help of this system, your final result should be 0. Why is it so? Well, there are 52 cards in a deck: according to Hi-Lo system, 20 cards of a deck are counted as + 1, 20 other cards are counted as -1 and 12 cards are neutral (counted as 0). Every time when you come to a casino and want to use Hi-Lo card counting system for blackjack you start your counting with 0. Every time when a card is dealt from a shoe you add or subtract one point and count cards in such a way; so, as you see, it is rather easy and you should not try to remember every cards which was dealt or left in a shoe. The closer to 0 your result is - the more advantage you have at this game. The perfect result is 0: increase your bet every time when your count is close to 0.